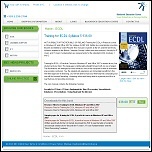 Retail e-commerce site for an educational book publisher. An e-commerce application which includes; a multi-currency shopping cart, real time secure credit card transactions, downloadable book companion files (eliminating a CD insert) and sample page display for the customer. For the merchant, there is full inventory management and a sophisticated order fulfilment processing / sales analysis back end. The client was impressed with the ease of use and flexibility of the site, and the back office inventory management and associated functions. In comparison to the previous site which carried the same stock, a significant increase in sales had been achieved. 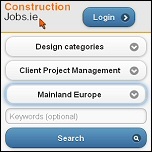 A mobile / tablet version of the ConstructionJobs.ie recruitment site. In order to extend ConstructionJobs.ie�s reach, a mobile / tablet version was created. This site has all the key functionality of the main site, but is designed for speed and ease of use in a mobile environment. This was achieved using the latest mobile web technology, which means the same site works on iPhone / Android etc. This resulted in a cost saving over developing apps for each phone type. Within a week of the launch ConstructionJobs.ie noticed significant numbers of visitors to the mobile site. Within a month there was a large increase to visitors and job applications the the overall ConstructionJobs.ie brand, when compared to the desktop only model. A recruitment site for the construction industry. We developed a highly functional database to support complex searching of jobs, with multiple search criterion possible, yet the site is extremely simple to use. Visitors may register and receive nightly, automatic email alerts as jobs are posted, in addition to online CV storage. To reduce the administrative overhead of the site, each advertiser is given a login ID which gives complete control to add, delete and edit their jobs, while the system automatically prepares billing information for each advertiser. 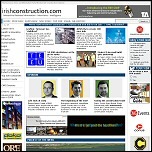 Online version of Irish Construction Industry magazine, Ireland's leading B2B construction publication. Using our Content Management System and additional bespoke developments, we created an easy to manage and flexible news site that is updated throughout the day by a team of journalists. Visitors are also kept informed by a regular email newsletter. In addition to news content there is a searchable database of industry suppliers. Other revenue generating features include fully integrated banner adverts and sale of magazine subscriptions using credit card payments. The site is used by many multinationals as a platform to promote their products. As well as generating additional subscriptions of the print version of the publication, the site generates sufficient advertising revenue to become a profitable entity on its own. Winner of the Periodical Publishers Association of Ireland "Best Online Publication". E-commerece site selling crystal products to the consumer market. Online store for energy efficient LED lighting products. Recruitment site for Recruitment and Sales talent. A document management site with controled access for members to aid in petroleum exploration research. Retail e-commerce site for O'Brien Diaries, where customers can order personalised diaries. and Natural Resources and approximately 15 oil companies.